We enter through the gates into the city (Rev. 22:14). One striking parallel is “These are those who…have washed their robes and made them white in the blood of the Lamb” (Rev. 7:14) and “Blessed are those who wash their robes that they may have right to the tree of life and may enter by the gates into the city” (22:14). The result of washing in 22:14 indicates that the multitude in Revelation 7 will be constituents of New Jerusalem. Another strong similarity is “They are before the throne of God and serve Him day and night…” (7:15) and “The throne of God and of the Lamb will be in it, and His slaves will serve Him” (22:3). Prior to the Lord’s second coming, the throne of God is in heaven, to which this multitude has been raptured (see link to note in first paragraph). In eternity the throne is in New Jerusalem, which has come down “out of heaven” to the new earth (Rev. 21:2, 10). “They will not hunger any more, neither will they thirst any more” (7:16a) is fulfilled in New Jerusalem by the fruit of the tree of life and the river of water of life (22:1-2). “The Lamb who is in the midst of the throne will shepherd them…” (7:17) matches “the throne of God and of the Lamb (22:1). The shepherding in 7:17 includes the tree and river in 22:1-2 and the Lord God’s shining on us in 22:5. These parallels show that the eternal blessing in New Jerusalem are presented in a general way in Revelation 7. 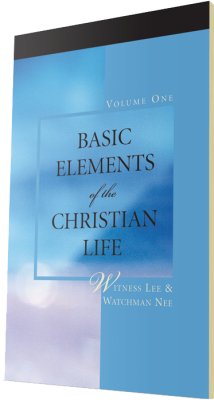 The first two lines of a hymn by Witness Lee (words music) are, “Enter the veil and go without the camp, Taste heaven’s sweetness, thus the earth forsake.” To enter the veil is to go into God’s presence in the holy of holies. The original holy of holies in the tabernacle is a picture of New Jerusalem as the eternal holy of holies (1, 2, 3). Inwardly, by faith in Christ, we are already a new creation (2 Cor. 5:17). 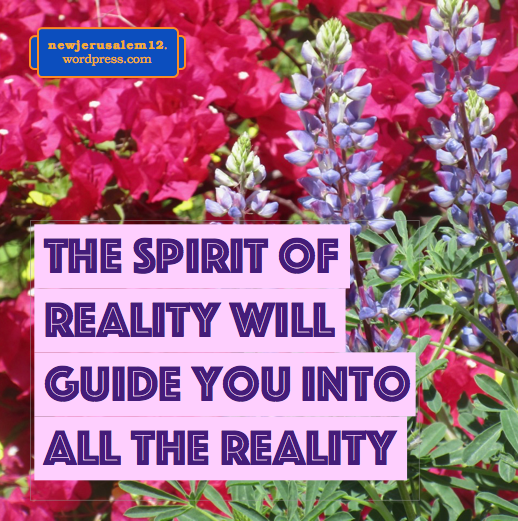 We are in the spiritual realm of the new creation, where the hidden reality of New Jerusalem is. 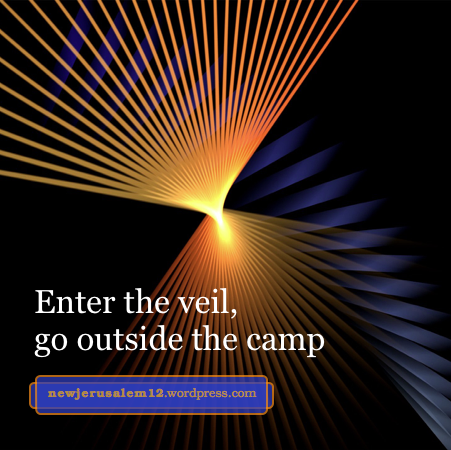 Now, in daily living, we need to enter the veil for God’s presence and go outside the camp. Colossians 3:1-2 exhorts us, “seek the things which are above, where Christ is, sitting at the right hand of God. Set your mind on the things which are above, not on the things which are on the earth.” To seek and set our mind on the things above is to enter the veil. To turn from earthly things is to leave the camp. Thus our inward being moves from the old creation to the new, the realm of New Jerusalem. 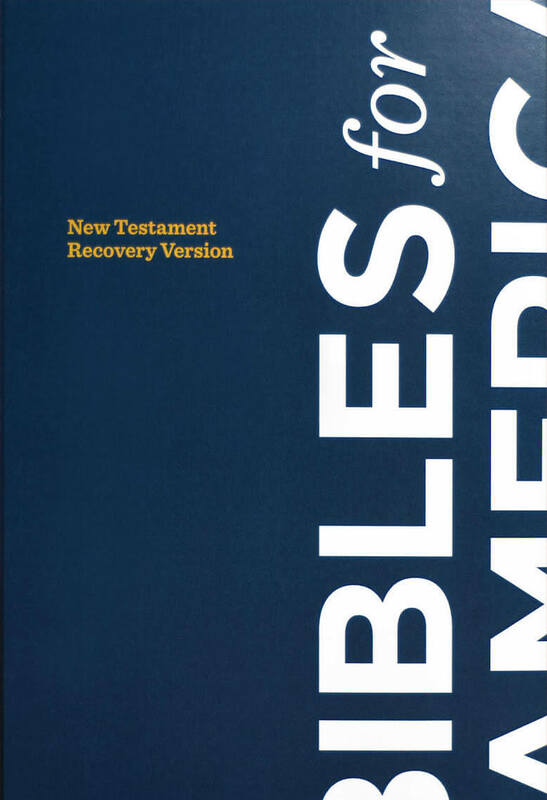 Over 500 publications by Witness Lee are available for online reading and searching. In Revelation 5 Jesus Christ is both the Lion and the Lamb. He is praised with the words, “You are worthy…for You were slain and have purchased for God by Your blood men out of every tribe and tongue and people and nation” (v. 5-9). 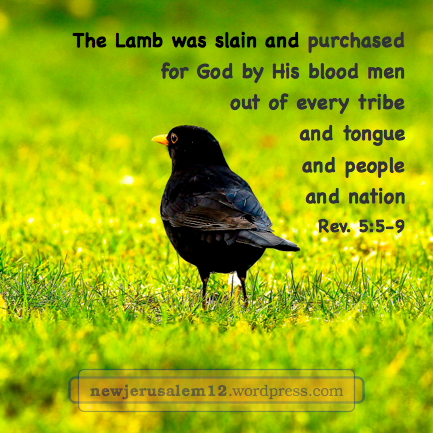 His death and purchase are to gain people for New Jerusalem. Verse 7:13 asks, Who are these who are clothed in white? Verse 14 answers, They have washed their robes and made them white in the blood of the Lamb. Verse 15 continues, Because of this they are before the throne of God and serve Him day and night in His temple; and He who sits upon the throne will tabernacle over them. This great multitude washed their robes, which means they received the Lord’s forgiving of sins. The end result of washing our robes is to enter New Jerusalem—“Blessed are those who wash their robes that they may have right to the tree of life and may enter by the gates into the city” (Rev. 22:14). The great multitude is before the throne serving God. 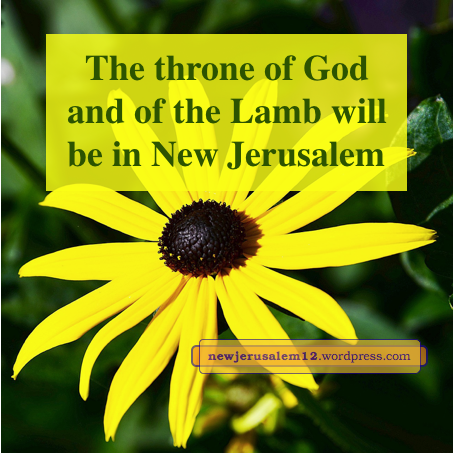 This is life in New Jerusalem—“the throne of God and of the Lamb will be in it, and His slaves will serve Him” (Rev. 22:3). Thank the Lamb for dying for us and purchasing us. Thank Him that we receive forgiveness from Him. Let us go on per Revelation 22:14 to eat Him as our daily food supply and enter New Jerusalem. Israel journeyed to Mt. Sinai where Moses saw and presented to them the heavenly pattern of the tabernacle. 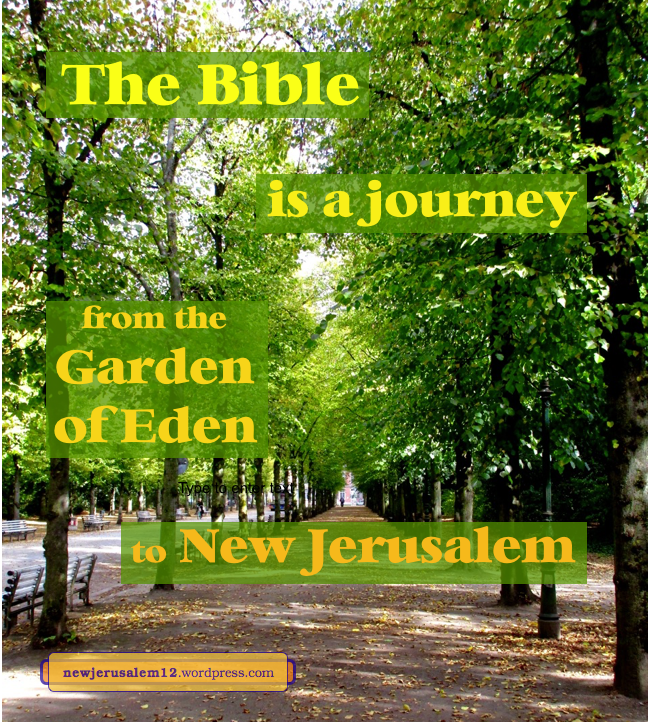 We are on a Christian journey to see New Jerusalem. After the vision of the tabernacle, Israel offered themselves for it, built it, and journeyed with it. Likewise, we see New Jerusalem, we offer ourselves to the Lord for New Jerusalem, we participate in building the Body of Christ as the forerunner of New Jerusalem, and we continue our Christian life in God’s New Testament building. 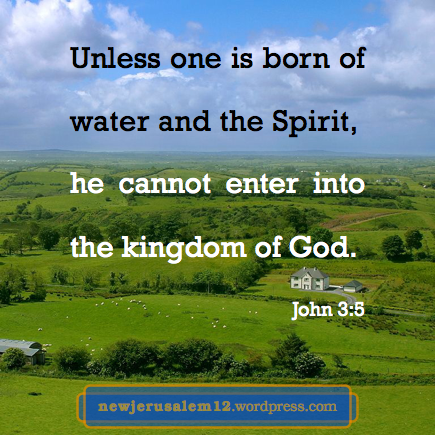 To be born again, or born anew, is to be born of water and of the Spirit in our human spirit (v. 6). The result of this spiritual birth is both the seeing and the entering into the kingdom of God. To the extent that we see, we enter. Our seeing of spiritual things is not once for all. Rather, our seeing gradually increases with our loving the Lord and giving ourselves to Him. It increases as we seek and pursue the Lord and respond to Him. It increases through our contact with the Lord in the Bible, through time with other Christians, through prayer, and through gospel preaching. Since our seeing of New Jerusalem is not once for all, our entering into it is not once for all but gradually. Lord, I am willing and available to You; bring me more into the vision of New Jerusalem. 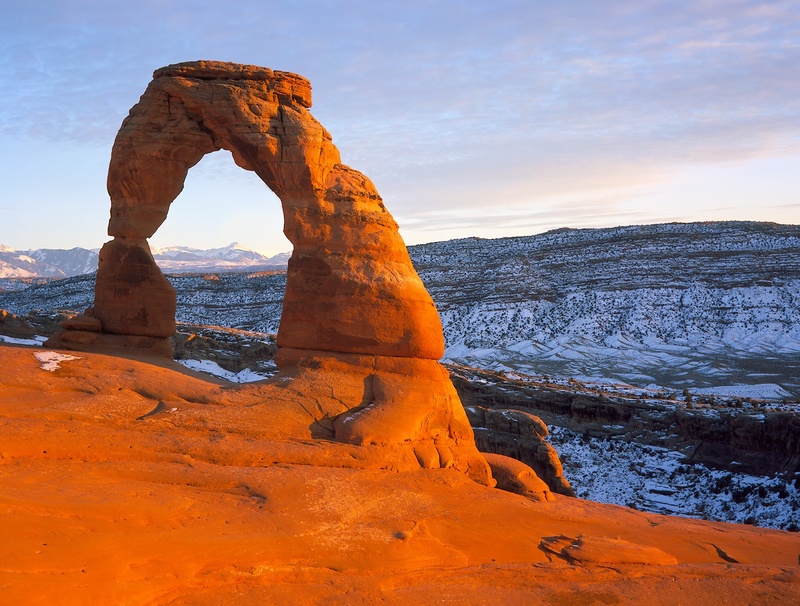 The metaphor in Galatians 4:21-31 tells us that Hagar, Abraham’s maidservant, and Sarah, Abraham’s wife, correspond to the Jerusalem on earth and the Jerusalem above; furthermore these represent two covenants, one of law and one of grace. 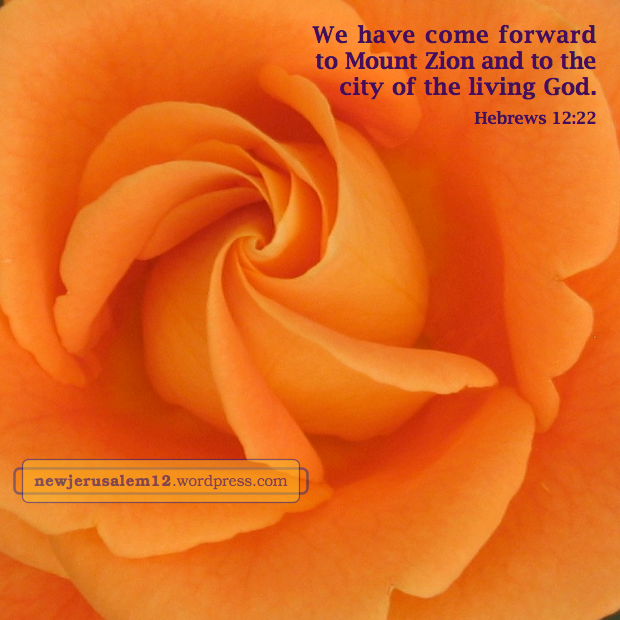 Hebrews 12:22 says, “You have come forward to Mount Zion and to the city of the living God, the heavenly Jerusalem...” The heavenly Jerusalem here is the Jerusalem above in Galatians 4; both are New Jerusalem. To come to the new covenant is to come to and receive what God gives us in Christ Jesus. This covenant was enacted by Jesus’ death on the cross (Luke 22:20) and Jesus Himself is the surety of this covenant (Hebrews 7:22). To receive the forgiveness of sins and to receive Jesus as our Lord and life is to receive the new covenant; this is also to receive New Jerusalem. To minister the Spirit who gives life (2 Corinthians 3:6) is to minister this better covenant; this is also to minister New Jerusalem. *An excerpt from Witness Lee, The Conclusion of the New Testament message 255, © by LSM. Thanks to Jordan Nguyen for the beautiful flowers. Jesus was going to the Father. He was going to the Living God, not to a physical place. We might mistakenly think He was going to heaven, but in this part of John He never speaks about heaven. Instead, He repeatedly speaks of going to the Father (John 13:1; 14:12, 28; 16:5, 17; 17:11, 13). Jesus told Thomas that we can come to the Father through Him. He also spoke of His coming to us and the Father coming to us and the Spirit coming to us (John 14:3, 18, 23, 26). 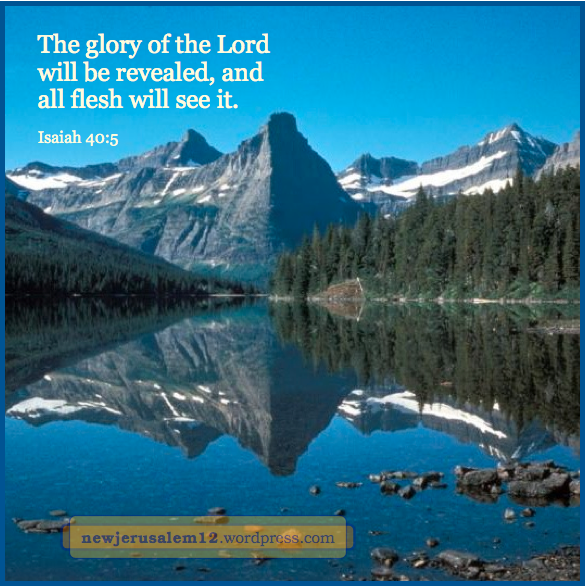 Now we abide in Him and He is us (John 15:4-5). His going, His coming, and our mutual abiding is our path to New Jerusalem. 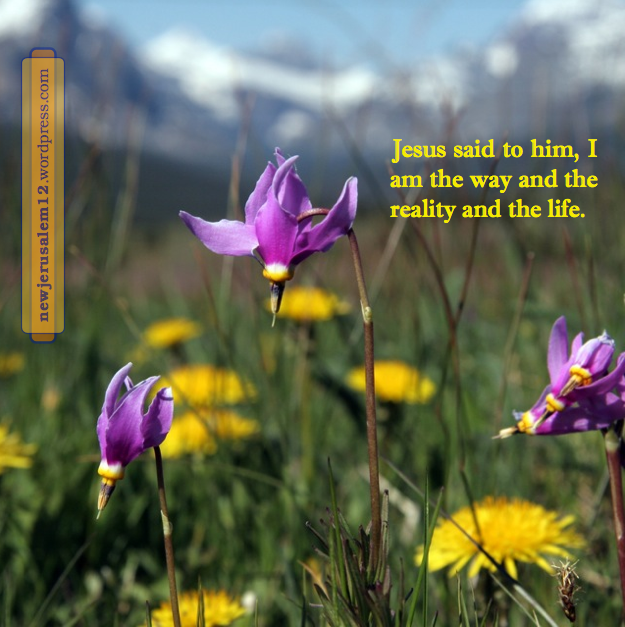 His going and coming and our mutual abiding are summed up in His words, “I am the way.” Jesus Christ is our way to New Jerusalem. Neither a physical path nor a set of rituals will take us there. Furthermore, we should not think of New Jerusalem as a physical location. On the contrary, Jesus said, “I am the reality.” The reality of the city is a living Person just as His destination in John 14 was a living Person. Praise Him! He is our way and He is the reality of our destination. Revelation 22:14 declares “Blessed are those who wash their robes that they may have right to the tree of life and may enter by the gates into the city.” Three steps are presented: we wash our robes, come to the tree of life, and enter into the city, New Jerusalem. To wash our robes is to cleanse our conduct by confessing our sins and receiving the Lord’s forgiveness and cleansing. This is clear from Revelation 7:14 and 1 John 1:7-9, and is an ongoing action on our part. As a result of washing, we have right to the tree of life. Cleansing brings us to life, even as in New Jerusalem the river of life flows out of the throne of the redeeming Lamb (Revelation 22:1). 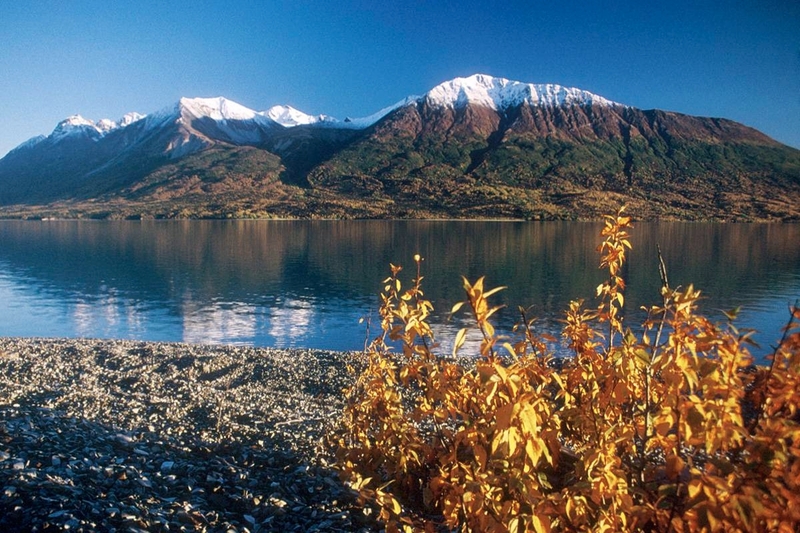 With the river is the tree of life (22:2) which depicts Christ as our continual supply of life. “He who eats Me, he also shall live because of Me” (John 6:57). We eat multiple times per day; likewise, we confess our sins regularly and we take Christ as our life supply regularly. By taking Christ as our life supply, we enter into New Jerusalem. The entry into the city is not physical but is by life, resurrection life. Today our entrance is into the hidden, spiritual reality of the city, in the corporate life of the Body of Christ. In the future we will be in the fullness of the city. Praise the Lord! 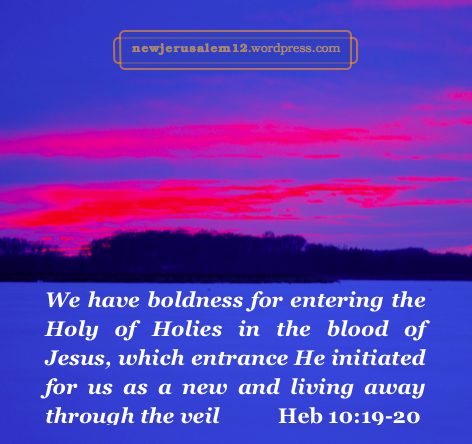 He shed His blood for our washing, He is our life supply, and He is our entrance into New Jerusalem. Here are words and music for singing Revelation 22:13-14.